The OurPluto naming campaign has been an exhilarating experience for me so far. The amount of thought that our site visitors have been putting into their nominations astounds me. You can visit the Site News page for regular updates. Today I would just like to highlight a few of the new names that we added to the ballot last night. On the list of scientists and engineers, we have added Carl Pulfrich, 1858-1927. 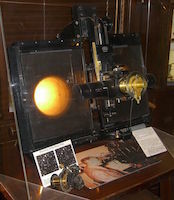 Although he died before the 1930 discovery of Pluto, he contributed in a critical way—he invented the blink comparator. This is a device that lets you switch back and forth between two sky plates, looking for subtle changes. Clyde Tombaugh discovered Pluto using a blink comparator. The discovery would not have been possible without the device. We also learned about Jeanne Baré who, a century earlier, became the first woman to circumnavigate the globe. She was naturalist studying the world’s plants. However, times being what they were, she had to impersonate a man for the journey. Our fictional explorers now include several popular nominees. Among others, we include a pair of the great travelers in literature, Don Quijote and his patient squire Sancho Panza. In Inuit mythology, we learned that the realm of the dead has an astronomical connection. The souls of the dead first spend time under ground in Adlivun, but later ascend to a permanent home in Quidlivun, on the Moon.